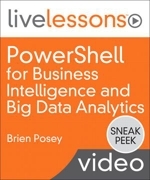 PowerShell for Business Intelligence and Big Data Analytics is a video course explaining how to use PowerShell to make sense of your organization's data. This video series explains how to connect PowerShell to a variety of data sources such as SQL Server, Active Directory, and more, and then use PowerShell to filter and even chart the data. Additionally, this course focuses intensely on creating PowerShell based GUI environments, and you will even learn how to create interactive business dashboards by using only PowerShell.